I'm still eating up the turkey! 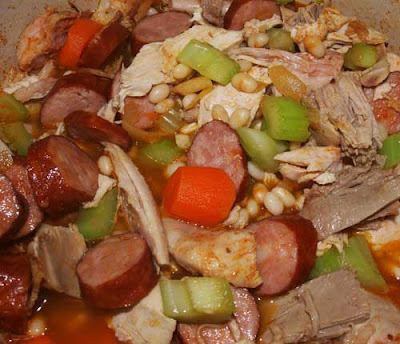 I had half a bag of haricot beans and thought I would make a Turkey 'Cassoulet', not the real deal of course, but a warming dish for a cold winter's day. There is no real 'recipe' here because I made it up as I went along, but here is what I did. 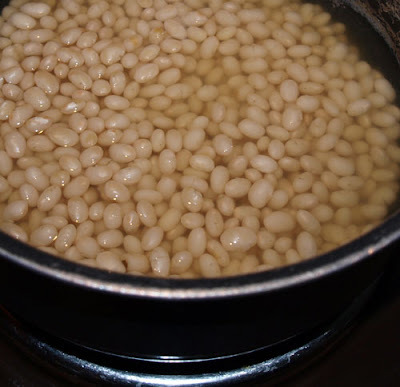 I soaked the beans overnight then boiled them for about half an hour until they were just soft but not mushy. 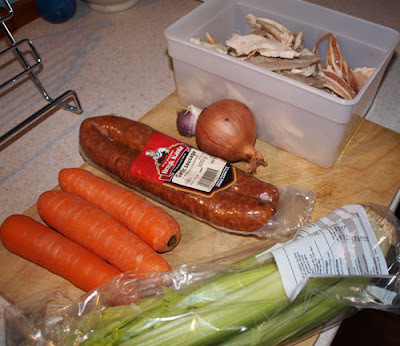 Here are the basic ingredients, two stalks of celery, three carrots, a smoked garlic sausage (I would have like a chorizo, but had to make do with this Polish sausage instead), an onion and garlic and the left over turkey and some bits of bacon that were cooked on the turkey breast. 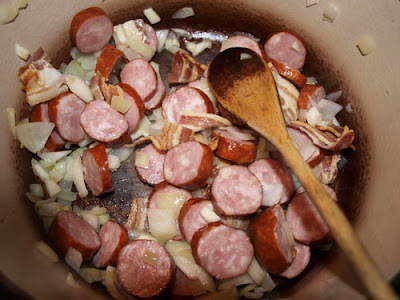 Gently fry the onion and garlic until soft but not brown, add the sliced sausage and chopped bacon and cook until the juices run. Then add the celery and carrots and saute them for 5 minutes with the other ingredients. Now add some spices. 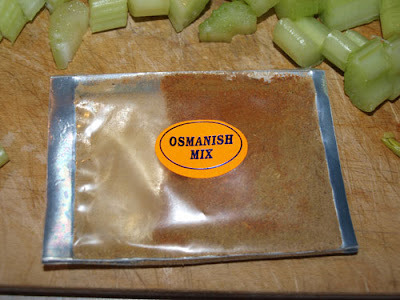 My SIL gave me some Turkish spice packs she had brought back from holiday and this was one of them 'Osmanish Mix'. I Googled it but cannot find out what is in this mix so if anyone knows I would be interested to find out. It doesn't seem to be chilli based as it is not hot. I put in 1 teaspoon of this mix and a teaspoon of paprika. 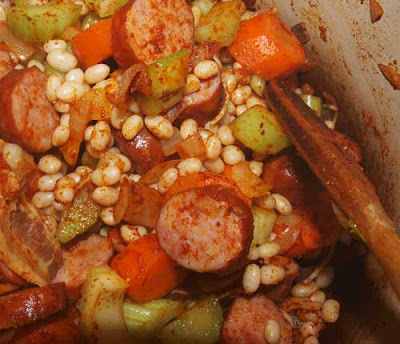 Mix that all in and cook for a couple of minutes. Add the beans and mix through, then add enough stock to cover the mixture and bring to a simmer. I then put the casserole in the oven at 150C for about an hour. After it was cooked I added some freshly ground black pepper and a dessertspoon of redcurrant jelly. 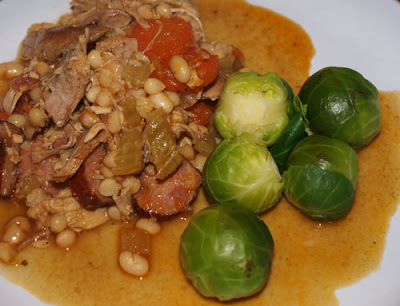 Oh yes, and I had some brussel sprouts left over too (uncooked) so cooked them up and served them with the cassoulet. What have you made with your left overs? Now, I am no expert, but I think Osmanish refers to a stew (originally from the Ottoman Era) and the ingredients and spices may vary according to what is available.... not very helpful, is it? It is possibly a generic spice mix for stews. I will ask a Turkish friend of ours and see if he knows what it is! Oh Yumm!! Great idea!!! Looks really delicious and I am lovin the sprouts! I finally froze the rest of our turkey. That way I can take some of it out later in January and it will seem like a treat again! This makes a perfect gift! I love the combination and the photos are fantastic as usual. Happy new year! This is where I shop. They are in Britain and have an enormous selection and they are really nice people running it.